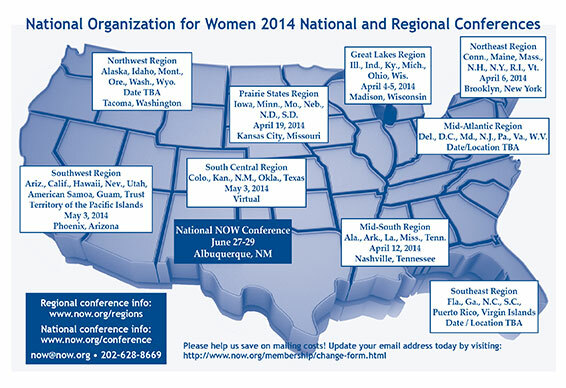 For up-to-date details about your regional conference and how to register, visit www.now.org/regions or call 202-628-8669. And save the date for the National NOW Conference! * All members of the region in good standing whose dues are received by the national organization or its appropriate subunits at least 90 days prior to the conference and who are present may vote. Eligibility to run for the National NOW Board: Any member who has been a member in good standing for at least two years immediately prior to the date of election. Board members must remain residents of the region from which they are elected.